Do you know that your soul is mirrored in your face and reveals many aspects of your character and temperament and even your relationships and future destiny? It is believed that face reading can instantaneously offer you valuable information about other human beings. Face reading gives you insights into your own and others’ character through an understanding of what their facial features reveal. This blog on face reading explains how to make the best impression on those around you and also how to understand the true character of others. Let’s take a look at some distinct areas of physiognomy.. Round face: They are known as water-shaped faced people. They have plump and fleshy face and are known to be sensitive and caring. If you are looking forward for a long-term, stable relationship, these people will prove to be the right choice. Oblong: Oblong types are considered to be very practical, methodical and with a tendency to overwork. They are most likely to have a muscular or athletic physique, which some equate to narcissism and may lead to problems in relationships. Square: A square face is linked to fire and such people may appear as aggressive, ambitious or domineering. They have a sharp, analytical mind and are decisive. Triangular: These faces are traditionally associated with a thin body and an intellectual persuasion. Chinese face readers associate this face with creativity, sensitivity and fiery temperament. Rectangular Face: They tend to dominate but with less force, often they get their way in politics, business or sports. They normally have a balanced approach – sometimes ambitious, sometimes melancholic. Oval: This face shape expresses a character which is somewhat balanced, sweet and charming. In which case, these individuals are often best diplomats but, beware, as they are also able to duplicate. 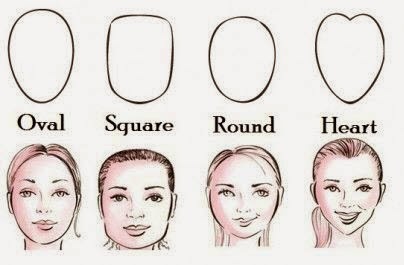 Oval faced women are often best artists. Sometimes they can be dangerous, but temperamentally they are weak, often they are weaker in physical strength and sometimes just inactive. This person follows a progressive style in his thinking; he can’t jump to the third point without first knowing the second. Sometimes he is misunderstood as a child and thought of as dumb, but in fact he may be very intelligent. It’s just his progressive style of thinking that needs to be taken into consideration. This person may not have a fast reflex action and may have problems working under pressure as he needs more time to think progressively. Such people jump to conclusions faster than you can think. They may interrupt you many times while you are talking because they keep on guessing what are you about to say. This person may get bored when talking to someone with a straight forehead because of the speed difference between them. The response of such a person is very fast and that’s why you will find most skilled football and basket ball players with slopped foreheads. Such people are quick decision-makers which may be problematic for them problems. Just notice how the forehead of those who study fine arts look like and you will notice how most of them have curved foreheads. Such people hate restrictions and rules, they like to use their imagination and would probably hate math and accounting but excel in arts. When the forehead is curved and at the same time occupies a big section of the head then this means that this person is a genius. You’d be safe asking that person for help if you are in need of a creative solution to any problem you’re facing. 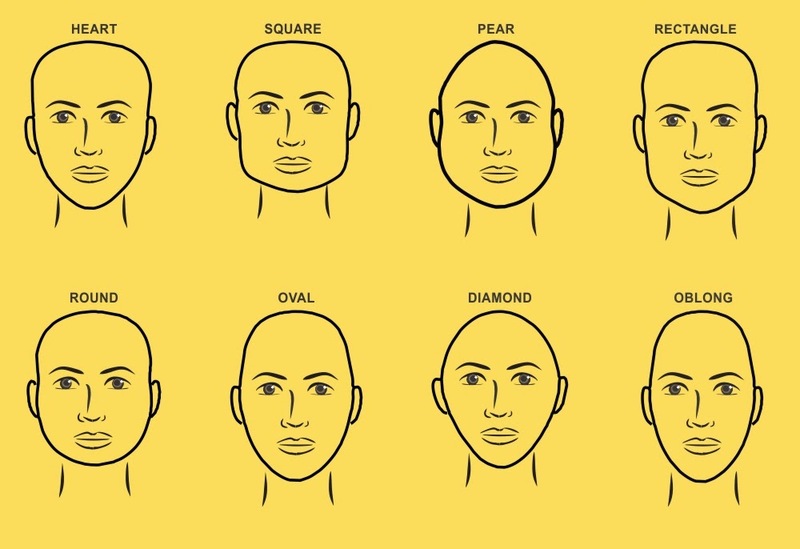 In real life many people will have a combination of more than one forehead profile. For example you might find a person with a slightly slopped forehead. The closer the person is to a certain facial feature the closer he will be to the personality traits associated with it. If someone’s facial feature lies in between two facial features then he might posses the traits of both facial features. 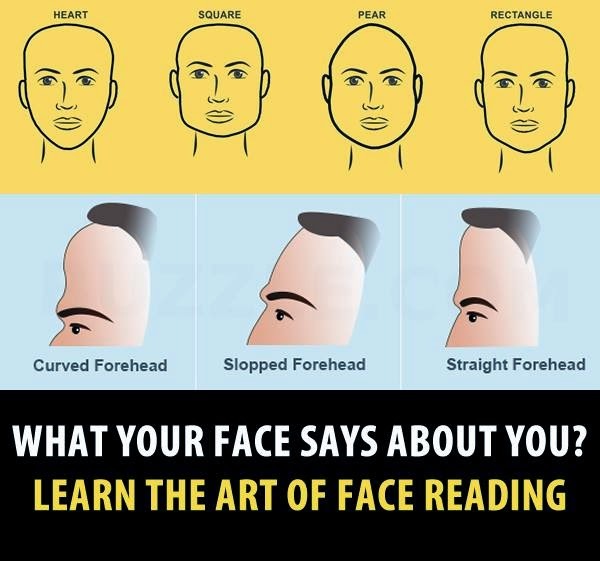 For example a forehead that is neither 100% slopped nor 100% straight might show that the person has a combination of both personality traits associated with both types. If the eyebrows are set apart, it represents broad mindedness. Eyebrows close to each other represent critical minded person who expects exactness in every work. If the eyebrows are high set, then it denotes an irresponsible attitude and superior tastes. If the eyebrows are low set and nearer to the eyelids, then they represent a prudent and calculative nature and an insecure mind. If the eyebrows are like a straight line, the person will be practical and unimaginative. The eye to eyebrow distance is the vertical distance between the eye and the eyebrows. This distance can tell you how fast that person can put a decision into action; that is how fast that person can put his plans or feelings into actions. Big distance between eye and eyebrows symbolizes the ‘wait and see’ approach. Such a person never rushes in things and is relatively slow when it comes to socializing. Small distance or almost no distance symbolizes the ‘just do it’ approach. Big lips: A person with big lips tends to be very talkative and will hardly ever be silent. This person likes to talk a lot and to tell stories. He or she provides very good company when present in a group but if that person wasn’t accompanied with good listeners then people may end up feeling irritated and annoyed of his continuous talking. Small lips: A person with small lips tends to be less talkative. He or she tends to keep his private life away from others and may hide his inner emotions and feelings. They can also hold on to secrets for years, unlike the guy who has big lips who can hardly hold a secret. A thin lipped person may be very cautious and not an adventure-lover. Balanced lip: Because human beings are different you can’t categorize every person you meet under the two major categories of big lips or small lips but instead you will find many people falling in between the two large categories. The more the person is close to one of these categories the more likely he will have the personality traits associated with it. Pointed chin: A person with a pointed chin is a stubborn person just like the one with long front teeth. Having both features together means that the person is very stubborn. This person has fierce inner resistance that can be triggered when someone pushes against him. When dealing with such a person, you must depend on your flexibility because pushing against him will yield no result. Square chin: A square-chinned person is called the challenger. That person always challenges problems by standing up whenever he falls. He never gives up until he reaches what he wants. He is usually very competitive and considers everything, even sports, as a challenge rather than looking at the fun part of it. This person has the ability of pointing out the pros and cons of any issue and this makes him a very good consultant and a debate lover. The small chin: A small chin is usually associated with a pointed chin. In face reading, whenever the facial features are relatively smaller to those of normal people then the person is considered a sensitive person. People with small chins and small facial features are very sensitive to criticism and overwhelming life events. Criticize those people and they will hate you, shout at them and they may not approach you again. In order to get along with a sensitive person try to be more nurturing than usual. Round chin: A person with a round chin is a friendly person, he is neither aggressive nor harsh. This person loves social gatherings and usually provides a very nice company. Protruding chin: What is meant by a protruding chin is that the chin seems to be protruding when viewed from the side view rather than being perfectly vertical. This person cannot let go of things easily and holds on to them as much as he can.